It was a fitting occasion for the friars and the CNEWA family, as members of the church gathered together to honor the legacy of the servant of God, Father Paul of Graymoor, who was among the first to respond to help the sufferings of Christians in the Middle East in the early 20th century. After a year and a half of displacement, Father Haddad understood that what his community really needs is not just assistance with food and medicine but hope for the future. The mobile clinic helps provide that hope. You can see a video the clinic in action below. There is much more at this link. 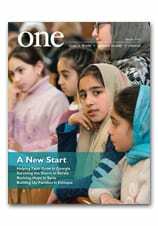 And check out the Autumn 2016 edition of ONE for more on CNEWA’s unique partnership with the Eastern churches. Defending religious freedom, fighting indifference to attacks on human dignity and promoting care of creation are obligations that Orthodox and Catholics share and areas where Pope Francis said he and Ecumenical Patriarch Bartholomew of Constantinople are in deep harmony. In anticipation of the 2 November celebration of the 25th anniversary of the Orthodox patriarch’s election, Pope Francis and retired Pope Benedict XVI joined a group of religious and civic leaders in contributing to a book, “Bartholomew: Apostle and Visionary,” published by the U.S.-based Thomas Nelson. The Vatican newspaper, L’Osservatore Romano, published the texts written by Pope Francis and Pope Benedict 12 October. Pope Francis speaks during his general audience in St. Peter’s Square at the Vatican, on 12 October. The pope called for an immediate cease-fire in Syria so that civilians can be rescued. Some of the most inspiring heroes we have met over the years are those who have remained devoted to their faith, in spite of almost unimaginable obstacles. Most recently, that includes the men, women and children who have been displaced by ISIS in Iraq. Mother of four and wife to Saaed, Fadia Matti reaches often for a roll of toilet paper that sits next to her. She uses the roll for tissues for her coughing or crying. Since arriving in the basement of an unfinished building in Erbil, she has developed respiratory problems, and a broken heart. Around Fadia sit her children: her daughter Inas, the eldest; 16-year-old son Nibras; 13-year-old daughter Aras; and Diana, 10, the youngest. Her husband Saaed comes into the enclosure, removes his boots and sits next to her. Around them lie the accouterments familiar to refugees and displaced people the world over: piles of foam mattresses, plastic containers, basic gas stoves, plastic sheeting and imperishable foodstuffs. The Mattis have ended up in perhaps the worst living conditions that Erbil has to offer for the arriving Christians. While others are housed in tents in the grounds of St. Joseph’s Church or in temporary structures in social centers or on floors above where the Mattis now live, the Mattis’ own living space is in the poorly-lighted basement. The open sewer for the entire building is nearby. A constant smell of refuse and excrement lingers. “My children get sick. I take them to the doctor. They get well. And then they get sick again,” says Fadia of the endless cycle of ill health that comes with living in such substandard conditions. You can learn what has happened to Christians in Iraq since then by reading Grace in the Summer 2015 edition of ONE and United in Faith, Prayer and Love in the Summer 2016 edition, chronicling the pastoral visit of CNEWA’s chair, Cardinal Timothy Dolan, to Kurdistan. The resilience of the Mattis and so many other heroic families continues to inspire the work we do around the world. If you’d like to learn how to help displaced families in Iraq, visit this page — and please, keep them in your prayers. In this image from last spring, children sing in a preschool for displaced children run by the Dominican Sisters of St. Catherine of Siena in Ain Kawa, near Erbil, Iraq. To see more and learn more, read United in Faith, Prayer and Love in the Summer 2016 edition of ONE.